Present state: Demolished - no evidence remains. 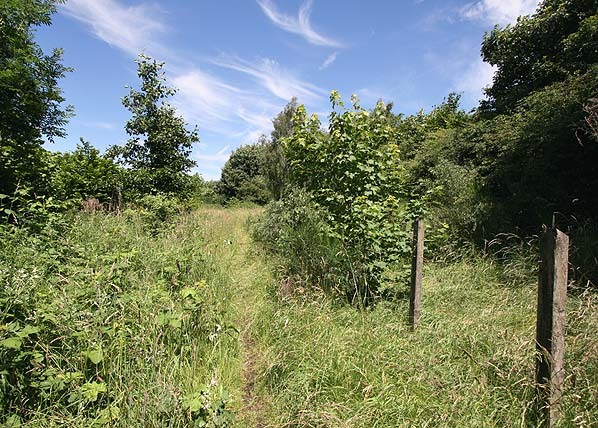 A public footpath follows the trackbed through the site of the halt. Notes: An untimetabled station was opened on 24th April 1909, it was mainly used for golfers using Nottingham City golf course, however in the First World War between 1915-1918 it was used by soldiers who were training in Bulwell Hall Park. They were known as the Bantams because of there small stature. 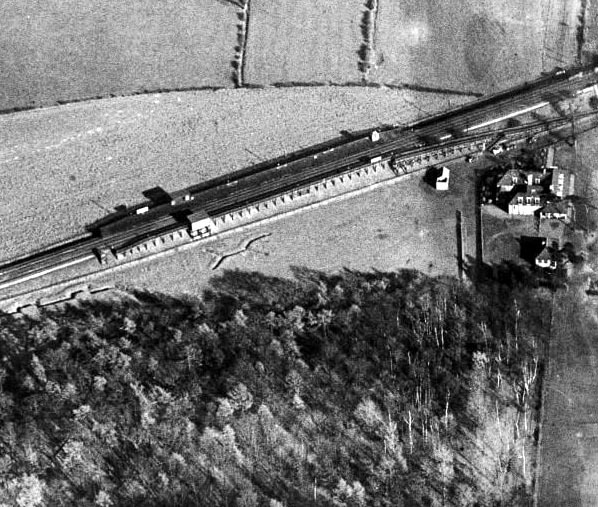 The platforms were of timber construction, 300 yards long, supported by trestles with the usual ramp at each end leading to a sleeper crossing of the two lines. There were timber waiting shelters near the north end of both platforms. The halt first appeared in the public timetable in July 1911 and closed on 5th May 1930. 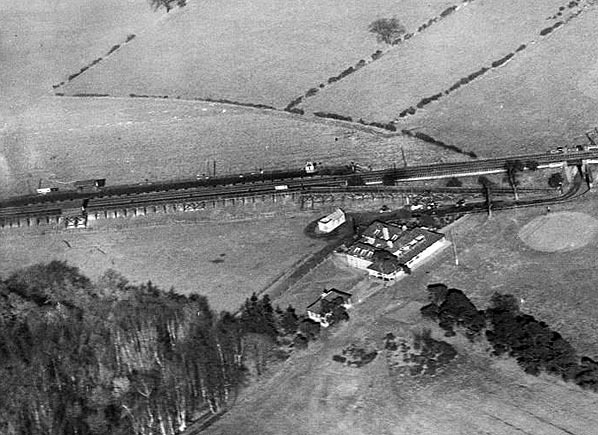 The only known pictures of the halt are aerial views. on an embankment or in a cutting adjacent to a road bridge, with access via stairs from the middle of the bridge; only the larger intermediate stations like Rugby and Loughborough had street level buildings. Because Edward Watkin also expected his trains to reach Europe through a channel tunnel, the line was also built to a larger continental (Berne) loading gauge. The Great Central opened for coal traffic on 25 July 1898, for passenger traffic to a new terminus at Marylebone on 15 March 1899 and for general goods traffic on 11 April 1899. Too see other stations on the Great Central Railway between Sheffield Victoria and Aylesbury click on the station name: Aylesbury, Waddesdon, Quainton Road (1st site), Quainton Road (2nd site)**, Calvert, Finmere, Brackley Central, Helmdon, Culworth, Woodford Halse, Charwelton, Braunston & Willoughby, Rugby Central, Lutterworth, Ashby Magna, Whetstone, Leicester Central, Leicester North***, Belgrave & Birstall, Rothley**, Swithland****, Quorn & Woodhouse**, Loughborough Central**, East Leake, Rushcliffe Halt**, Ruddington, Ruddington Factory Halt, Arkwright Street, Nottingham Victoria, Carrington, New Basford, Bulwell Common, Hucknall Central, Annesley South Junction Halt, Hollinwell & Annesley, Kirkby Bentinck, Tibshelf Town, Pilsley, Heath, Staveley Central, Renishaw Central, Killamarsh Central, Beighton (1st site), Beighton (2nd site), Woodhouse Junction, Woodhouse*, Darnall*, Sheffield Victoria & Sheffield Bridgehouses. 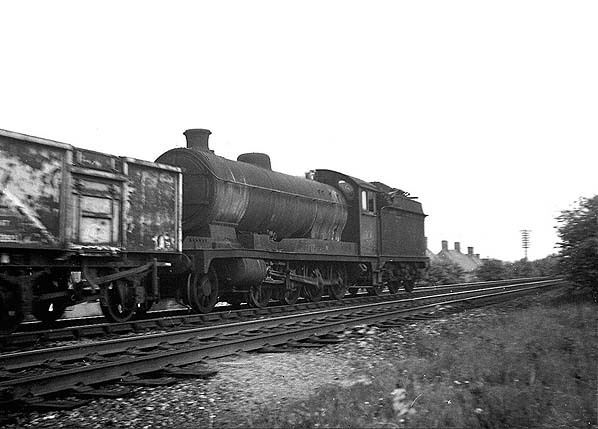 Bulwell Hall Halt in 1928. A 9F hauls a northbound freight through the site Bulwell Hall Halt in 1965. 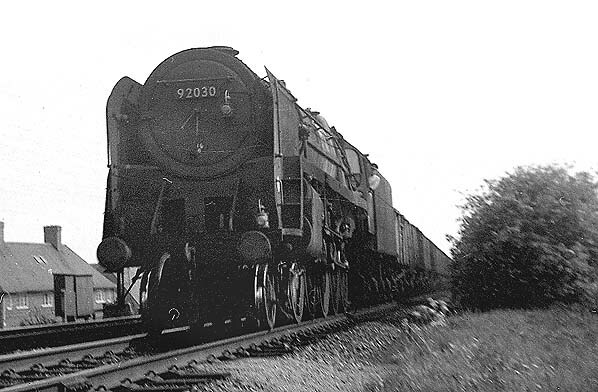 A southbound freight runs through the site Bulwell Hall Halt in 1965. The site of Bulwell Hall Halt looking north in July 2008.